The winner of three Academy Awards, The Killing Fields turns 30 in 2014, and Warner celebrates with this Blu-ray Book. 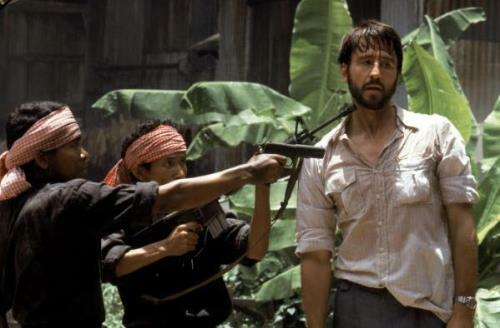 The war movie stars Sam Waterston (TV’s Law & Order), John Malkovich (Red) and Haing S. Ngor (The Dragon Gate) and is based on the true events of the 1975 takeover of Cambodia by Khmer Rouge, the terrorist government that killed nearly 3 million people. Waterston plays Pulitzer Prize-winning New York Times reporter Sydney Schanberg, who stays in Cambodia after the government falls and convinces his friend and translator Dith Pran (Ngor) to stay too to report on the bloodbath and the U.S. role in precipitating the horror. Released on 1984, the R rated film also stars Julian Sands (The Girl With the Dragon Tattoo) and Craig T. Nelson (TV’s Parenthood) and was directed by Roland Joffe (Vatel) from a screenplay by Bruce Robinson (The Rum Diary). Ngor won The Killing Fields one of its Oscars for Best Supporting Actor. The other statues came for the movie’s cinematography and editing. It was also nominated for Best Picture, Best Director, Best Adapted Screenplay and Best Actor for Waterston. The Blu-ray is packaged with a 36-page book containing rare photos, production notes and other material.